When it comes to modern day smartphones, there are many different kinds and makes to choose from, so much so that it can get rather overwhelming for the first timer, wondering just which particular model should one pick that best suits one’s needs. Alcatel has just announced the availability of their Alcatel OneTouch C1 that will be made available for AT&T’s pre-paid GoPhone product portfolio. Starting from this month onward, the OneTouch C1 will retail for $59.99 a pop for those who are interested, and the OneTouch C1 is said to complement AT&T’s device portfolio as it delivers extremely affordable pricing, accompanied by a stylish design to boot. Not only that, there will be an efficient 1.0GHz dual-core processor that runs underneath the hood, alongside a crisp and responsive 3.5” HVGA display, which ought to be decent enough for beginners to get going. Apart from that, the OneTouch C1 will allow one to enjoy more productivity thanks to multi-tasking support that will enable you to simultaneously run apps, games and even to browse the internet. 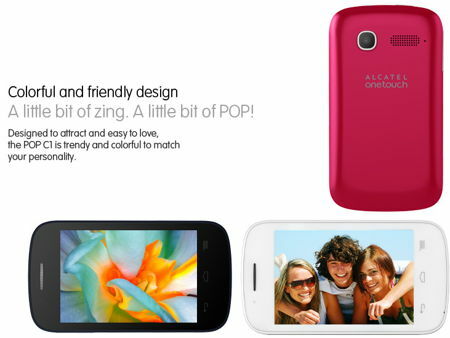 As for some of the hardware specifications that are found in the Alcatel OneTouch C1, they include an ultra-compact 3.5” HVGA touchscreen display, a 2MP camera at the back with 4x zoom capability, a lightweight design at just 3.53 ounces, a 1,400mAh battery that theoretically speaking, is able to last for up to 7 hours when it comes to talk time and up to 540 hours of standby time. Storage-wise, you get 512MB RAM alongside 4GB of internal memory, where the latter can be further expanded thanks to a microSD memory card slot. At launch, it will run on the Android 4.2, Jelly Bean mobile operating system, and hopefully an Android 4.4.4 KitKat update will be made available sooner rather than later. Any takers for this upcoming phone? If you know of someone who is about to make the jump to the world of smartphones after all this while, perhaps this might be a good place to begin.